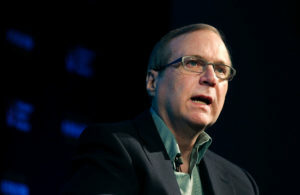 SEATTLE — Paul Allen, who co-founded Microsoft with his childhood friend Bill Gates, has died. He was 65. Allen’s company Vulcan Inc. said in a statement that he died Monday. Earlier this month Allen said the cancer he was treated for in 2009, non-Hodgkin’s lymphoma, had returned. Allen and Gates founded Microsoft Corp. in 1975. Microsoft’s big break came in 1980, when IBM Corp. decided to move into personal computers. IBM asked Microsoft to provide the operating system. The decision thrust Microsoft onto the throne of technology and the two Seattle-natives became billionaires. Both later dedicated themselves to philanthropy. Over the course several decades, Allen gave more than $2 billion to a wide range of interests, including ocean health, homelessness and advancing scientific research.